Enter our scholarship competitions and summer programs for high school students! 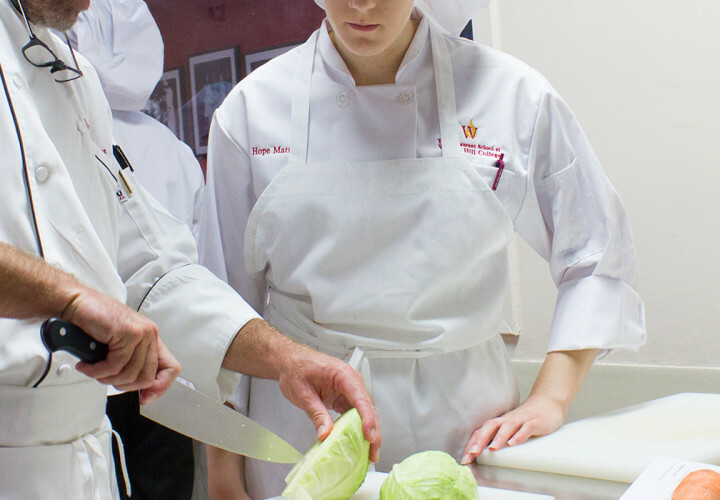 Every spring, Walnut Hill College holds its very own Culinary and Chocolate Competitions to discover and recognize rising talent among high school students. Each competition is open to juniors and seniors and is separated into two divisions: high school and vocational-technical school. The Culinary Competition challenges students to cook chicken and one side dish using an array of ingredients provided in our kitchens. While everyone receives the same chicken recipe, each student must create their own side dish without using a printed recipe on competition day. This twist to the competition really brings out the inventive cooking ideas we love to see! For our Chocolate Competition, all of the students must bake a chocolate cake at home in advance of the competition. What sets each cake apart is the extraordinary design work that each student puts into his or her confection! Whether they choose to design a simple but elegant cake or go all out with a multi-colored, multi-layered masterpiece, the students are encouraged to be creative. Each division of the Culinary and Chocolate Competitions awards scholarships to three winners in the amounts of $6,000, $3,000, and $1,800 to be used toward tuition at Walnut Hill College. The high school of the first-place winner in each division also receives $500 for its Family and Consumer Science Department or Culinary Arts Program. To register, please fill out the form below or download a copy of our Competition Booklet and submit the attached registration form. *Please note: Each high school is allowed to register one student in the Chocolate Competition, one student in the Culinary Competition, or the same student in both competitions. We do not allow more than one student from the same school to compete in the same competition. CLICK TO LEARN ABOUT OUR OTHER SCHOLARSHIPS! Join us for a two-day adventure into the world of hospitality. We’ve created a hands-on program that will get you involved in culinary and pastry arts as you take a regional gastronomic tour of the United States, with “stops” in New Orleans, Chicago, Georgia, North Carolina, California, the Florida Keys, New Jersey, and, of course, our very own Philadelphia. In just two days, you’ll gain a true understanding of what this rewarding field has to offer. You’ll also discover what makes Walnut Hill College exceptional: an approach to learning that focuses on YOU–the student. Download our 2019 Culinary Arts Summer Camp Brochure and submit the attached registration form. Each year, Walnut Hill College presents its Summer Institute for high school juniors. 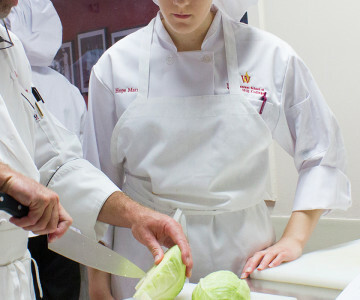 You’ll get a taste of what our students experience during Culinary Arts, Pastry Arts, and Management classes catered just to you. For three days, you’ll learn about exciting career options within restaurants and hospitality, participate in fun off-campus events, and meet other students who are just as passionate about the industry as you are. Download our 2019 Summer Institute Brochure and submit the attached registration form. IS A CAREER IN FOODSERVICE OR HOSPITALITY RIGHT FOR YOU? TAKE THE QUIZ! Our fun online quiz takes 3 minutes to complete and you’ll get a personalized report. Identify your strengths and social style plus the training and positions you’re best suited for. Click here to get your FREE Career Training Readiness score now.